I have a 10-year-old son who is planning to undergo removal of his front tooth as a result of a bike accident and two unsuccessful root canals. I would like to know what would be the best options for him post-surgery (flipper vs. Maryland bridge or anything else?). Also, I am concerned about long term health risks involved in the surgery techniques (removal of entire ligament) and potentially toxic materials used. Could you please provide any recommendations and/or questions I can address to our surgeon? Your advice is greatly appreciated. I get this from a lot of people—that their oral surgeon has suggested a Maryland bridge as a temporary restoration to replace a front tooth while waiting for a young person to get old enough to be able to do a dental implant. For the benefit of others who may be reading this, the reason we don’t want to do a dental implant on a young person is that their face is still growing and jawbone is continuing to be laid down. Natural teeth move along with the newly grown bone, but a dental implant remains fixed. As the child continues to grow, he or she would then develop a discrepancy between the vertical position of the natural teeth and the position of the implant tooth. So we wait until growth has completed and then place the implant. I don’t fully understand the resistance to giving the patient a removable temporary tooth. A dental flipper, otherwise called a flipper partial, is inexpensive and looks fine. It can be made without clasps, as shown in this picture, or with a couple of metal clips over back teeth. Yes, I suppose the child could lose it, but you could buy several of these flippers for the cost of a Maryland bridge. And there is a strong motivation for the child not to want to be seen without their tooth. I have to believe that those dentists who suggest using a Maryland bridge as a temporary tooth replacement haven’t done many Maryland bridges. The main problem with doing a Maryland bridge in this situation is that it probably won’t stay in unless you do some tooth preparation on the adjacent healthy teeth. And if you are drilling into those teeth, that’s not what I would call a temporary restoration, because the traces, or scars if you will, will remain there forever. If the teeth aren’t prepared, then the bridge probably won’t stay on for long. If it actually does stay on, you have an added complication in the difficulty in removing it without damaging those supporting teeth. Furthermore, if the Maryland bridge is metal, the flipper will be more esthetic. The metal wings of the bridge are bonded to the backs of the adjacent teeth, which will darken them. About your other question on the other risks of the surgery, I don’t understand the question. When a tooth is removed, usually the entire periodontal ligament comes with it. If it doesn’t, your body will resorb it, so I don’t understand what the issue is. And there are no toxic materials used in an extraction. It wasn’t the University of Maryland. It’s amazing to me that people come up to my father telling him that the bridge he put in 30 years ago is still holding up. The short story is that, back in the 60s, a Proctor and Gamble executive came to my father because he didn’t want a partial and his bridges never lasted. My father built the so-called Maryland Bridge for him and he was a happy patient for years to come. According to my father’s colleague, Dr Harvey Oury, the P&G executive retired and moved to Maryland where his new dentist Dr. Livaditis, along with Dr Van Thompson were amazed at the bridge. Instead of seeking out my father they took the idea and developed it at the University of Maryland as their own idea. I am trying gather his old dental records and patents to prove this fact. Again. I don’t want any money nor do I want to embarrass the other doctors! I just want to have my dad’s legacy known as my gift to him and his ailing health. Thanks for that story, Chip. In all fairness, I guess we should rename the Maryland Bridge the Halbauer Bridge. Maybe that will catch on! A cantilever Maryland Bridge? It won’t work. My 9-year-old daughter has lost her left front permanent tooth in a scooter accident. The tooth is gone completely. One dentist suggested a clip-on tooth until she can have an implant but we saw a specialist and he suggested a Maryland bridge (zirconia with 1 wing) that is connected to the other front tooth. Thanks for you answer in advance. Oh no, this would be a very bad idea to do a Maryland bridge attached to just one tooth. The dentist suggesting that doesn’t know what he is doing. Number one, It won’t stay on. There would be too much stress on the false tooth. Even when a Maryland bridge is attached on both sides it is hard to get it to stay. Attached to one side I would be surprised if it lasted a month. Besides that, it would produce unnatural stresses on that other front tooth, possibly leading to the loss of that tooth also. As a minimum it will require irreversible grinding on that other front tooth. No, do the removable clip-on tooth. 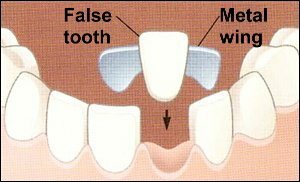 But it would be even worse if the Maryland bridge did stay on, because it would create a rotating force on the tooth it was attached to and you would end up with the false front tooth sticking out and the natural tooth it’s attached to would be rotated. This is called a cantilever bridge, because it is suspended from only one side. To be stable, a cantilever bridge needs to be supported by at least two other teeth. Attached to just one tooth it will have the problems I mentioned. Her next little accident would result in the loss of both teeth. Do a removable clip-on tooth. Because of the way her teeth will be changing over the next few years, you will probably have to replace that removable tooth at least a couple of times until she is old enough for an implant, but that is the only reliable way to replace that tooth right now. ANYTHING you do will have to be replaced the same. Just go with the removable tooth. Is the metal in a Maryland Bridge MRI safe? Is the metal used in a Maryland bridge M.R.I.safe? – Kevin from the U.K.
You’re referring to the use of metals with magnetic properties that should be avoided around magnetic resonance imaging machines. There is an excellent article that discusses this issue on a blog called the MRI Metal Detector Blog, and I would refer anyone with more questions about this to that blog. There is another piece from the National Institutes of Health about the interactions between MRI and dental materials, but they offer no definitive conclusions—they only bring up the problem. The metal in a Maryland Bridge is generally a non-precious dental alloy. It has to either have some beryllium in it or be tin plated. Neither of those metals has magnetic properties. But often the metal will have cobalt and/or nickel also, possibly a lot of cobalt or nickel, and both these metals do have magnetic properties. If that is the case, would the pull of the MRI machine be enough to dislodge the bridge? I doubt it, but I confess that I don’t know enough about the MRI machines to say for certain. I would refer the question to an MRI technician. To function in the mouth, a Maryland Bridge has to be designed and bonded so as to resist chewing forces, which are very heavy forces. If chewing won’t dislodge it, I doubt that an MRI machine would be able to. But Maryland Bridges can sometimes be done without proper designing to resist dislodging forces, which is why patients have problems with them falling out from time to time. There are other types of dental work that also use these alloys. Crowns and bridges, as well as removable partial denture frameworks, can be made out of non-precious alloys (also called base metal alloys). Crowns and bridges, again, should be cemented very securely so that they resist chewing forces, and I have a hard time believing that a conventional crown or bridge could have an issue with MRI forces. A removable partial denture, however, is not fastened very securely, and if there is any cobalt or iron in the framework, my recommendation would be to remove the prosthesis before having an MRI. Can you replace two teeth with a Maryland Bridge? Is it possible to have a Maryland bridge with two false teeth? Yes, two teeth is the maximum I would attach to one Maryland Bridge, but I would only do that in the lower front where the teeth are smaller. You have two factors that cause added stress as you extend a bridge to multiple teeth. The first is rather obvious–you are adding to the amount of force borne by the bridge. You get twice as much vertical force on two teeth as you do on one. The second is less obvious–you are allowing the bridge to flex more. As you apply force to the bridge, the longer the span the more it will be able to bend. That flexing puts a lot of stress on the abutments. When those abutments are crowns, you may be able to get away with covering a span of three teeth if you double-abut on one side. But when the abutment is just a plate bonded to the inside of a tooth, which is what you have with a Maryland Bridge, even a span of one normal-sized tooth can be chancy. I can’t find anyone in the Dallas area that knows about an Encore Bridge. Do you know anyone who does this procedure or is it outdated? The Encore Bridge was never widely popular. It is very technique sensitive, meaning that many dentists weren’t doing it right, resulting in a weak bridge that might either de-bond or break. Furthermore, it was developed by master dental ceramist Uri Yarovesky of Opus One Laboratories in California, and he has been the only lab doing this procedure, to my knowledge. He may even have a patent on it. Recently, another aesthetic alternative to the Maryland bridge has developed—the zirconia Maryland Bridge. Zirconia is an extremely strong ceramic that has excellent optical properties. This is easier to place than an Encore Bridge. 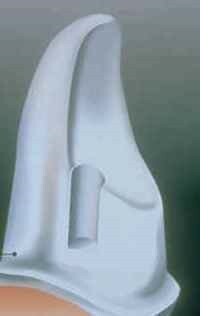 Here is a photograph of a zirconia Maryland Bridge, courtesy of Dental Arts Laboratories of Peoria, IL. Some caution is still needed, however. While not as technique sensitive as the Encore Bridge, it is still technique sensitive, and unless a dentist has done several of these successfully, I wouldn’t ask him or her to do one on you. Dentists who haven’t done many tend to think that it can be placed with little or no tooth preparation, but if that is done, there is a strong tendency for the bridge to come loose. An expert cosmetic dentist who does a lot of porcelain bonding work should understand how to do this well. The best approach would probably be to ask a dentist if they have done any of these. If you can’t find an experienced dentist to do this, then I would ask for an understanding up front that if it fails that you will get your money back, or some such guarantee that will be satisfactory to you. Uri Yarovesky, the inventor of the Encore Bridge, tells me that he has research data showing that the Encore Bridge is stronger than the zirconia Maryland Bridge because it has a greater ability to flex with tooth movement. I have recently had #24 [lower central incisor] pulled due to the gum receding. My dentist had a Maryland bridge made and I am allergic to it. What other options are there? There is not enough room for an implant. The periodontist suggesting removing #25 and replacing with one tooth but I fear I will look more like a side show attraction than I already do. HELP… Am searching for answers. I had to laugh when I heard the suggestion of your periodontist, of taking out the adjacent tooth also and then replacing the two teeth with one large tooth. That sounds so much like a typical dentist and so out of touch with what a patient would want. I agree with you that you could look like a side show. But another option similar to this would be to place one implant supporting two teeth—that can be done also. A Maryland bridge consists of a porcelain tooth bonded onto a metal framework. The framework has metal wings which are bonded to the lingual side (inside surfaces) of the two adjacent teeth. In order to bond properly, that metal has to be etched. The etching produces microscopic irregularities in the surface that make the metal bond well to dental bonding resins. And there are two ways to make that metal etchable. One is to use an alloy that contains 1-2% beryllium. Usually that metal also contains nickel and chromium as primary components, but it doesn’t have to. The problem with such an alloy is that about 10% of the population will have an allergy or sensitivity to the alloy. That allergy could be to any of these three components, or all of them, as all are known to provoke sensitivity reactions in some people. The other way to create an etchable surface on the metal is to plate the metal with tin. When that is done, a semi-precious alloy can be used—one that is made of maybe palladium and silver. Such an alloy is hypoallergenic. The alloy itself isn’t etchable, but the tin plating is. So that is an option for you. A final option would be to make the bridge out of zirconia. Zirconia is a metal oxide, a compound of the metal zirconium plus oxygen, and is extremely strong. It is a ceramic and is white and translucent, similar to porcelain. Some people call it “ceramic steel.” And it can be etched so that it bonds to dental bonding resin. This, to me, is a better way to go. Not only does it eliminate the sensitivity problem, it is more esthetic since there is no metal to darken the adjacent teeth. I had an Encore bridge done in 2012 and the tooth has now come off the bridge, but the back of the bridge is still attached to the gum and the other two teeth. Can the tooth be re-attached to the bridge and where can I go in CA ,or a nearby state, to have it done and at what cost since my insurance has been used already this year? It is a top tooth next to the front teeth. The Encore bridge is tricky to do in the first place, and repairing it is even trickier. You can’t just do the bonding over again. The dentist has to thoroughly clean off all the old bonding material. Then the surface of the porcelain tooth has to be re-etched so that it will bond to the luting composite. This requires either having hydrofluoric acid, or what is called a micro-etcher, which is a mini sand blaster to treat the surface of the porcelain, or both. Cleaning off the surface of the resin framework is not as critical and that could just be scraped clean. If the porcelain is properly prepared, it should adhere to the framework. Though I wouldn’t expect it to last as long as the original. You got three years out of the first installation–I would expect less than that this time. So I’d start saving up to have a dental implant placed as a long-term solution. Note – I wrote a post about 3 1/2 years ago about the lifespan of a Maryland bridge where I included some comments about the lifespan of an Encore bridge. I had my upper 6 front teeth pulled due to periodontal disease. I was going to have 4 implants with two pontics, but asked for something less expensive. So we are talking about doing a permanent bridge. I have read about the Maryland Bridge and feel now that maybe the separate implants with two pontics would be better? They have charged me the same price so my question is …would 4 implants and two pontics be better? I can’t really prescribe anything specific for your case without seeing you, but I can be some help here by giving you some guidance from basic principles of bridges and restorative dentistry. If you are accurately telling me what your dentist is telling you, then something is very wrong here. A permanent dental bridge replacing six missing upper front teeth on any patient with significant gum disease would be a disaster waiting to happen. It’s not going to last, and in the end will be by far the most expensive option. Other options would be far better in multiple ways. And I’ll explain why. I’m going to explain this in some detail here for you and then use this explanation as a blog post that will hopefully help others with similar questions. So you are saying that you have had the front teeth extracted, which would be teeth numbers 6 through 11. Here are a couple of principles of doing bridgework that every dentist is taught in dental school. First, any bridge needs to be supported by teeth that collectively have the same amount of support as the missing teeth. In other words, if the bridge is replacing two medium-sized teeth, it needs to be anchored by at least two medium-sized teeth. If four small teeth are missing, they could maybe be supported by two large teeth, if those supporting teeth are twice as large as the missing teeth. So, you are missing four medium-sized teeth (6, 8, 9, and 11) and two small teeth (7 and 10). To support that adequately, you need four medium-sized teeth (4, 5, 12, and 13) and probably one large tooth (3 or 14). So you are ending up with an extremely complicated 11-unit bridge, consisting of six false teeth supported by five existing teeth. Now I suspect that your dentist, especially if you are pressing to save money, may be planning something less than this. But breaking this rule would severely limit the lifespan of the bridge. Second, when you start adding supporting teeth, you increase the likelihood of failure for two reasons. 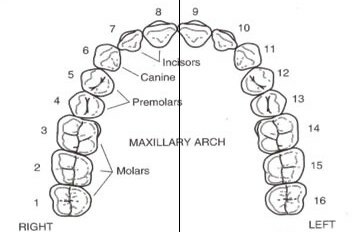 One is that each supporting tooth has to be prepared to be perfectly parallel to all the other teeth. Getting five prepared teeth to be all parallel to each other (or even four) so that the bridge fits perfectly is extremely demanding, and I would not ask a regular family dentist to do that. When you add to that complication the problem of having teeth on opposite sides of your mouth, making those parallel is a very tricky proposition. Another reason is that if you have any kind of trouble down the road with any of the supporting teeth – decay or gum disease or any other significant problem – the entire bridge will have to be re-done. How expensive is that going to be? Way more than implants. Third, with six missing front teeth you have what is called a cantilever effect. Look at the diagram and imagine that tooth #4 is missing. This tooth could be replaced with a simple three-unit bridge – the missing tooth #4 supported by teeth #s 3 and 5. Notice that these teeth are pretty much in a straight line. There would be no tipping forces at all when chewing stress is borne by tooth #4. This is the type of stress these supporting teeth are designed to take. But now compare this with teeth #s 6 through 11. These are on a curve. 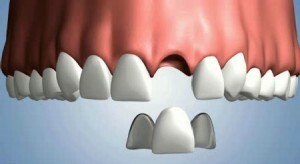 The strongest bridge between teeth #s 5 and 12 would be on a straight line between the two teeth. But that kind of a bridge would go across the roof of your mouth and wouldn’t make any sense. So we have to loop the bridge out around the curve. Have you ever seen a highway bridge that curves out like that? Of course not. They always form a straight line between the supports. The reason for that is that when you’re out on that curve, you create tipping forces which put a large amount of stress on not only the supporting structures but the entire bridge. This force becomes a force that wants to twist and push the two closest anchors (#s 5 and 12) and actually pull the remaining anchors out of their sockets. These are stresses that these teeth are not designed to take, and the life expectancy of such a bridge would be pretty short. You would probably end up losing all of the anchor teeth, in addition to the six you are already missing. To compensate for that added stress factor, your dentist could try anchoring with six teeth instead of five. But then you increase the risk also and may end up losing all six of them. The conclusion of all this is that a permanent bridge replacing six front teeth would be a bad idea for someone with healthy gums in the hands of some of the most expert dentists in the country. When you add the complicating factor that you have significant gum disease, and add that to the possibility that your dentist may be an average family dentist, you are courting disaster. Anything other than the fixed bridge. Don’t end up in our collection of cosmetic dentistry horror stories. The most economical solution would be a removable partial denture. With today’s acrylics, this could be made to be very esthetic and could have clear acrylic clasps that would be virtually invisible to anyone else. There are some inconveniences to having a removable partial denture, but the cost would be a small fraction of the cost of any other option. The most comfortable and highest quality solution would be using dental implants. Now whether or not you could support the false teeth with two or four implants would depend on how much bone support you have and the stress of your bite. My advice? Get a second opinion from an excellent dentist. (See my posts about how to ask for a second opinion.) There is an excellent dentist near you with a national reputation. I’ll send you his name as well as another who is quite a bit further for you but whose fees would be considerably lower. Some dentists will give second opinions for free. But even if you pay $100 for it, that would be much more sensible rather than throwing $10,000 or more at a solution that may only last a few months, even if you don’t end up having the second dentist do the work.